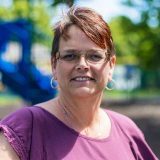 BethAnn teaches a K4 class and has many years working in preschool environments as both a teaching assistant and a classroom teacher. She returned to ECSP in summer 2018. She loves spending time with children and you will hear music coming from her classroom on most days. BethAnn and her husband Peter are a blended family of 4 girls and 2 boys, with their youngest being a high school senior, class of 2019. They live within the Lake Monticello community and have resided in Virginia since the 1990’s.